After an injury or just a lazy winter, reintroducing physical activity can be difficult & stressful. By doing routine exercises and Physical Therapy, you can improve performance & get back to improving your health! When taking time off from physical activity, your body is likely to lose tone, condition, and flexibility. Letting yourself ease back into a fitness routine allows your body to get back into a rhythm of working out. Lowering weight, decreasing duration, using proper technique, drinking lots of water, and eating healthy are all important for starting your training. When rushing back into active routines, injuries are more likely to arise. 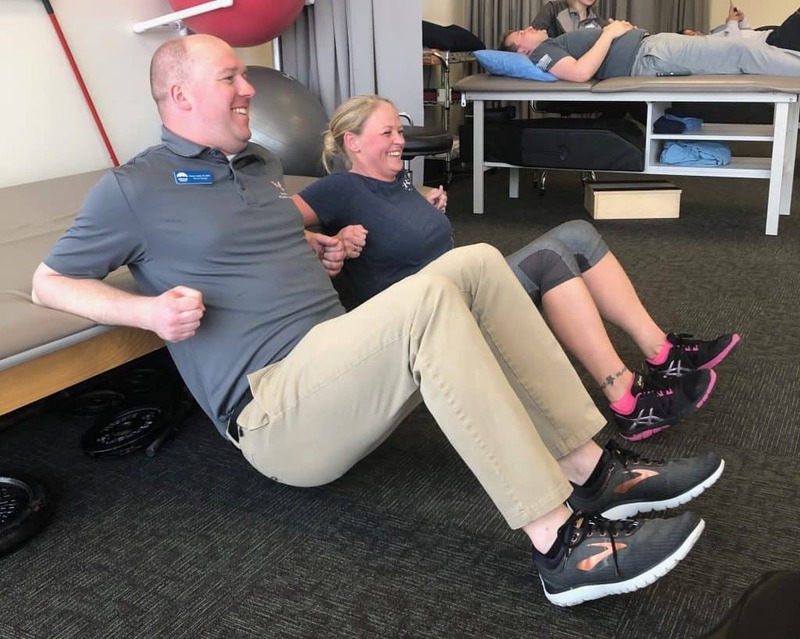 Teton Therapy Physical Therapist, Ashton Hanson, treats a patient for her foot & ankle. The foot and ankle are complex structures that absorb a large amount of force with every step. Following injuries, or with age, ligaments and other structures in the foot can change, resulting in poor or aggravated forces on the foot and ankle. Pain can occur from poor stability, lack of mobility, or lack of strength in the stabilizing muscles. 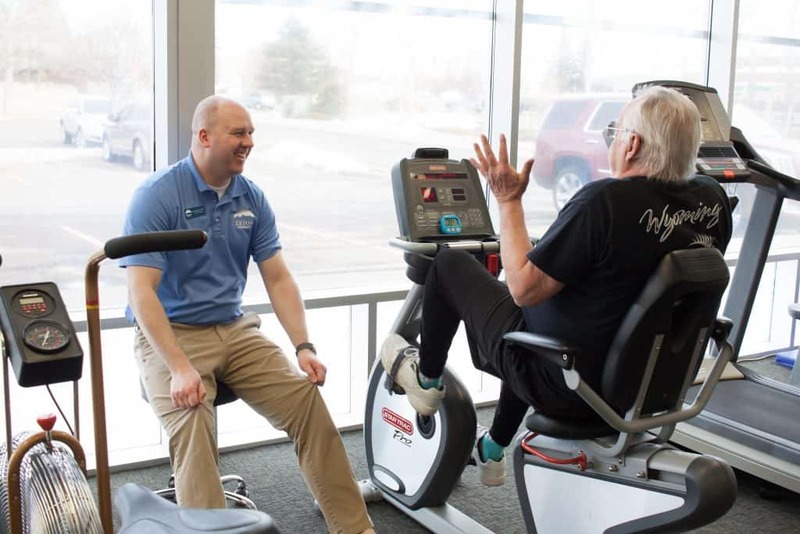 Teton Therapy Physical Therapist, Kenny Smith, warms up a patient on the bike before treatment. 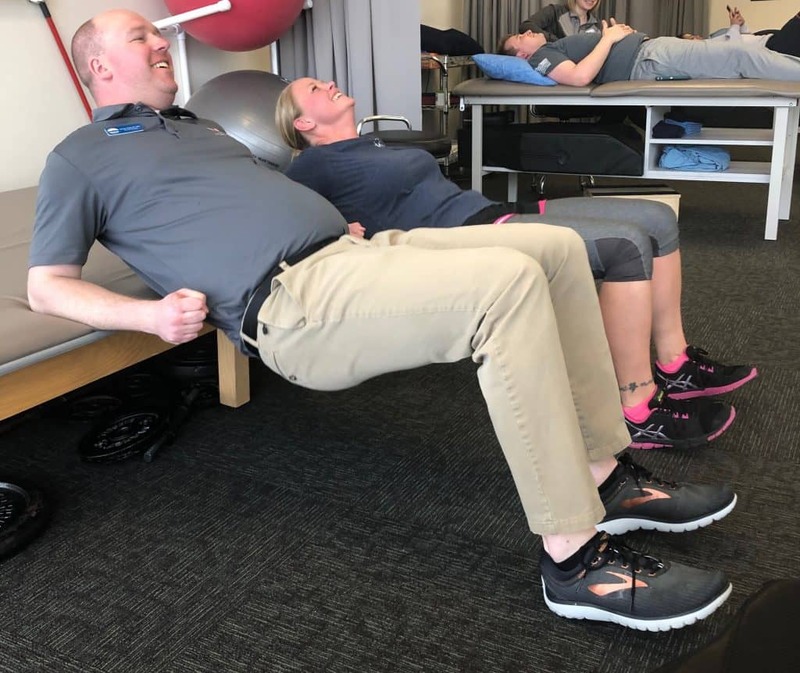 Teton Therapy Physical Therapist, Kenny Smith, works with patient, Jim D., on single leg exercises. Injuries and other medical conditions can affect your balance and make you feel unsteady on two feet. Performing single leg exercises are good for functionality and balance, it forces you to engage different muscles to keep yourself stabilized. By doing single leg balance exercises, you are strengthening your hips, knees, ankles, and feet. Whether it be an ankle sprain, stroke, or simply even aging, all of these have an effect on your balance. Performing simple balance exercises can improve stability and help prevent you from falls in the future. 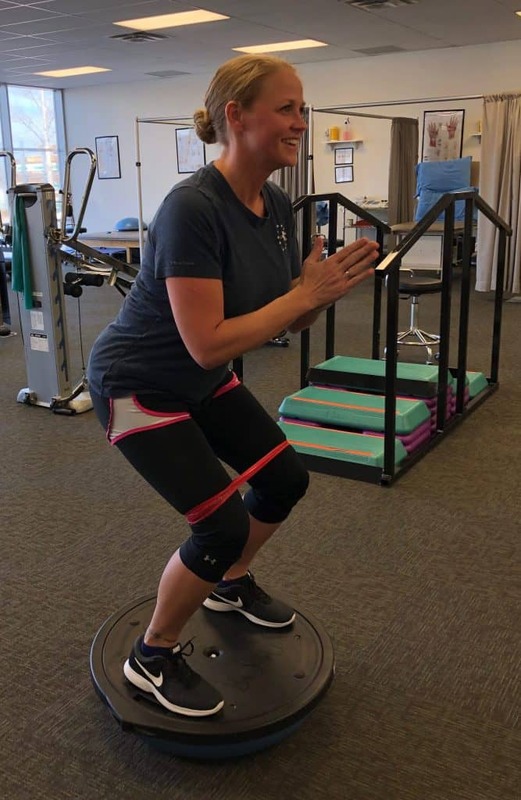 Teton Therapy patient, Joyce B., works on the BOSU ball for lower extremity strength. Originally, the “BOSU” in BOSU ball was an acronym for “Both Sides Up.” Meaning that they can be used either ball side up or platform side up. BOSU balls are used for a variety of exercises, allowing you to modify your stretching as well as strength training. Adding variety to your workout is a great way to incorporate different benefits, in addition to keeping you entertained and interested in your workout! Another good exercise for lower extremity are hip thrusts. The hip thrust is a glute exercise designed to improve your strength and flexibility by using optimal hip extension. A lot of knee and hip problems can be solved by performing hip thrusts. This exercise also targets different areas of the low extremity: glutes, hamstrings, quads, hip flexors, and lower back muscles. Get the Right Pair of Shoes! Choosing the proper workout shoes is crucial when getting back into a healthy routine. Getting the right pair of shoes help protect against common injuries, as well as providing arch support. Appropriate cushioning can also help alleviate or prevent knee, hip and back pain, as it improves body mechanics. Wearing good workout shoes can also improve your running! 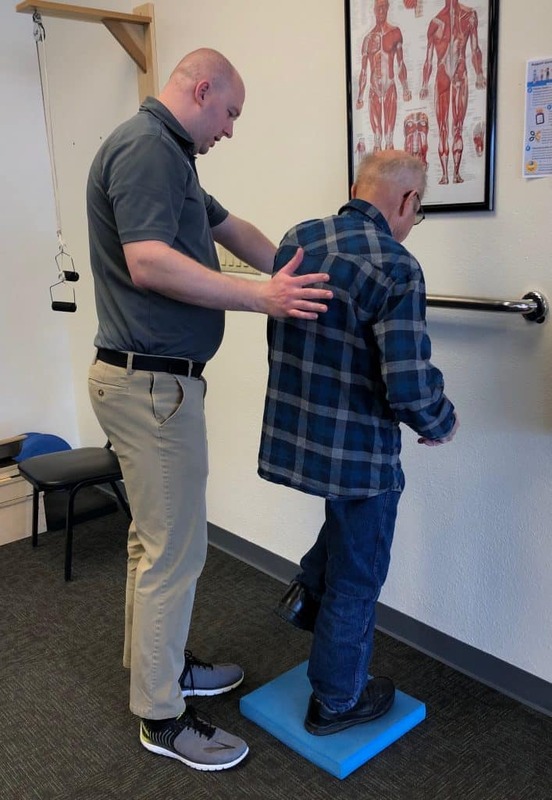 At Teton Therapy, our physical therapy staff have years of training in evaluating the movement of your foot, ankle and legs. We perform an analysis of your foot and ankle joints as well as the muscles in your legs. Additionally, we analyze your walking and running patterns to determine the root cause of your foot pain or ankle pain so it can be treated quickly and effectively.